Written by Isabella Anderson If you visit Monteverde in your Costa Rica travel vacations, besides the popular Monteverde Biological Reserve, there are other places to visit while you are in town. I couldn’t go to all the places that I will list, but some of my friends have, so we made a little list that could help you to maximize your time in Monteverde. Monteverde’s Frog Pond is very popular for Costa Rica family tours, and you can visit in the day and night with the same ticket. Butterfly Garden: Lots of species of butterflies, but also has other insects like the rhinoceros beetles and tarantulas. The ticket includes a guided tour. For the snake lover, there’s the Serpentarium, with over 40 species of snakes. There are also frogs and other reptiles and amphibians. Bat Jungle: This is amazing. It’s a guided tour in a closed environment with several species of bats. One of the great Costa Rica eco tours. Orchid Garden: Hundreds of species of orchids, including the smallest in the world, the size of a pinhead. You gotta see it to believe it. Monteverde is an agricultural town, so you can sample the coffee at Cafe Monteverde, visit the Cheese Factory and taste Costa Rica’s finest cheese, with over 10 varieties. Selvatura: It’s kind of all in one theme park, with canopy tours, zip lines, suspended bridges, butterfly garden, and a huge private collection of rare and bizarre insects, called Jewels of the Rainforest Bio-Art Exhibition. A guided tour with lunch will cost you $120. 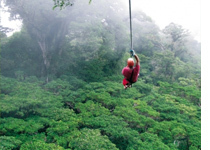 Besides the canopy tours and zip lines, some companies offer aerial trams over the cloud forest. Horseback riding is also popular, with trips around Santa Elena also to La Fortuna for the most adventurers. You can also hike at Santa Elena and Monteverde, and the “Bosque Eterno de los Niños” (Children’s Eternal Forest) is recommended, and one more choice the the San Luis Waterfall, a beautiful cascade that is also hard to reach. Definitely, there’s so much to do at Monteverde, that I recommend you to stay for several days to enjoy your Costa Rica vacation package to Monteverde and Santa Elena. You can get here on bus ($5 from San José), private shutter (around $35) or rent a car. A 4x4 is a must. For more Monteverde Hotels & Accommodations, contact our travel agency.